Yoga Fit is one of the top-selling Yoga WordPress themes on Themeforest. It is a feature rich theme which a Yoga Blogger, Yoga Guru or Fitness institution would love to use. This theme comes with a timetable plugin which can be used to display the classes curricula. It also has an Events calendar through which people can find out Yoga events near to their location. However, the EVENTS Calendar PRO plugin needs to be purchased separately. Since the theme is WooCommerce compatible, setting up a store to sell products, such as Yoga Mattresses and herbal medicines, would be easy. This theme also has premium sliders and a custom admin panel to make things attractive and easy. Yoga Fit theme has a wonderful Team page which lists down the strengths of the authors. It also has a lot of custom shortcodes which can be used to show various components in your post. The Visual Content Composer Plugin, which comes with this theme, helps non-coders to design their homepage or site by dragging and dropping elements. This would surely make the designing experience fast and easy. Asana WordPress theme is a clean and modern theme. It is built using the Flat UI concept which is one of the latest web design trends. It is also fully responsive and has clean code. It comes with different color options which can be used as the primary theme color. So, in case you don’t like the default color, you can directly edit the color from the theme panel. Like Yoga Fit, it also has the Events section. However, this looks a way different from the one in Yoga Fit. You can check the screenshot below to see how an event post would look like. Asana theme has the ability to integrate with Google Calendar. Isn’t it great? Thus, your students can access the schedule on Google Calendar android app or website, without even opening your website. This theme comes bundled with some premium plugins like Slider Revolution, Calendarius (helps to manage yoga classes and fill in a schedule with ease), Uni Avatar, and Uni Woo Wish & Bridal Lists. Yogi is a clean-coded and eye-catching WordPress theme. Though this responsive and retina-ready theme is best for building websites in the Yoga niche, it can also be used for events, spa, fitness, beauty and health training website. It has 4 custom post types – Class, Trainer, Testimonial, Event. The Class section allows you to create class schedules. The trainer custom post type helps you to add details about a Trainer – including his areas of strength and qualifications. The Event post type allows the webmaster to add various events. Like the other themes, this theme also has tons of shortcodes and widgets. You can also start selling products without shifting the platform, as this theme supports WooCommerce. Yogi has a drag and drop website builder, which will make the designing easy. This theme also has an inbuilt page called Membership which allows you to list down various membership packages. 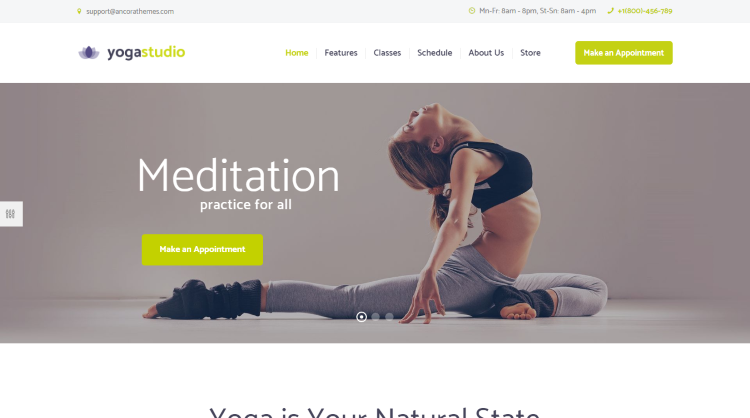 Yogastudio is a minimal and modern design WordPress theme. It is suitable for building Yoga, gym, health and fitness websites. The classy look of this theme would surely attract a huge number of people to join your institution. The theme has 3 pre-designed attractive homepages. It also has a proper 404 error page, an attractive schedule page, classes page, team members and locations page. It also supports WooCommerce like the above themes. Besides, it also has a blog section where announcements can be made. VEDA WP theme is a multipurpose theme with a lot of unique demos for various niches. The Yoga demo of the VEDA Theme looks attractive and has a lot of features which a Yoga webmaster would love to have. Hence, we have included it on our list. If you are planning to start a Yoga tutorial website, then this theme offers a proper video page which will help your students to find videos based on filters such as student category, yoga style, and teacher. It has a lot of pre-built pages such as Teachers page, Teacher directory, Pose page, Events, and Programs. This theme supports WooCommerce and comes bundled with a lot a premium plugins like Visual Composer, Slider Revolution, Layer Slider, etc. 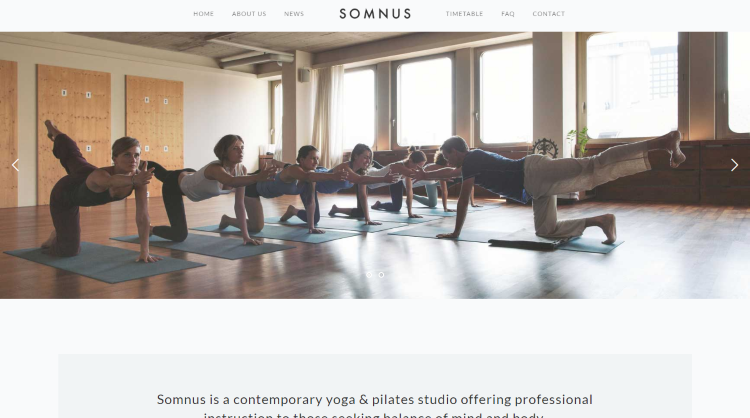 Somnus is a minimal WordPress theme for Yoga Studio websites. Although some people might not like minimal themes, there are a lot of people who prefer Minimal UI so that the content is in focus. This theme has a very simple and quickly loading timetable feature which can be used for listing the class schedules. The news section is where you can add informative news for the Yoga lovers/students to read. Although Somnus theme doesn’t have a lot of features like the above-mentioned themes, it is one the best themes to settle with, if you are looking for minimal design and super fast performance. Cosmedix is a flat, modern and clean Yoga WordPress Theme. It can also be used for Health, Spa and Fitness websites. It is translation ready and supports RTL. This WooCommerce supported theme includes 6 homepage styles and 4 header styles. Just like the other themes, Cosmedix offers important custom post types like Classes, Events, Testimonials, and Trainer pages. It comes bundled with premium plugins like Visual Composer, Gravity Form, WPML, Layer Slider, and Slider Revolution. The Sport Center WordPress theme is another great modern theme. While it looks best for Yoga related sites, it also can be used for gym training, dance training, and sports websites. It has been built on one of the best responsive frameworks – Bootstrap. It is clean-coded and has a lot of features which would force you to buy this Theme. The theme also comes with premium plugins like Revolution Slider and Visual composer. Isn’t that great? This theme has a lot of inbuilt pages like team page, events page, services page, membership, and testimonials. Listing testimonials on your website would certainly help you to get new customers. Overall, the theme looks very attractive and professionally designed. 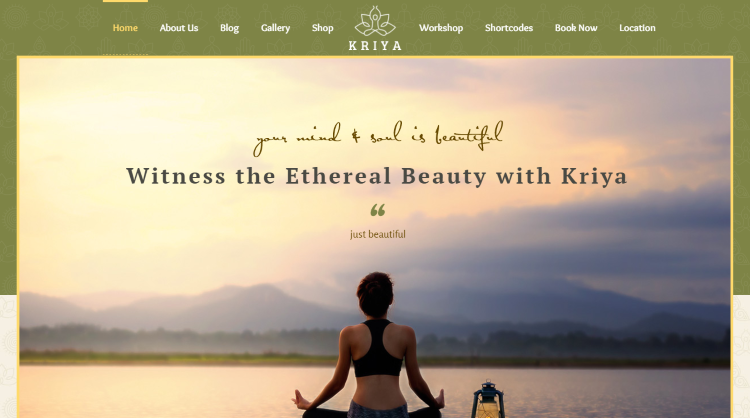 Kriya Yoga WordPress theme is a dedicated WordPress theme for Yoga and Health websites. This theme gives you the feel of the ancient Yoga setup. It has a lot of pages like services, poses, and courses which are essential for a Yoga site. In case you are planning to start a site which would list Yoga events nearby, then you can use the Events features in this theme. This theme has a lot of shortcodes and comes with an inbuilt reservation form. It also has a nicely designed contact page. Also, the page loading animation is quite unique. 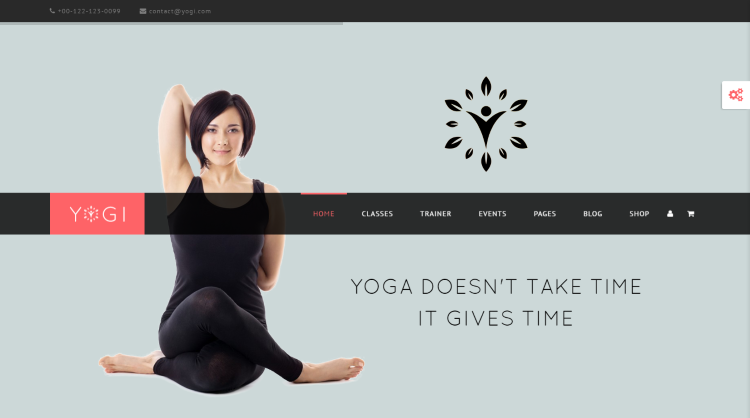 Yoga is another WordPress theme specifically developed for Yoga websites. This simple yet elegant theme is search engine optimized. It supports fluid and boxed layouts. Everyone loves fast loading sites – even Google loves them. So special attention has been given to that part so that the theme loads quicks. Yoga theme includes important page types like timetable, classes, and instructor page. These pages have been cleanly and beautifully designed. It also includes a simple and lightweight page builder. Thus you can easily and quickly create any kind of pages. 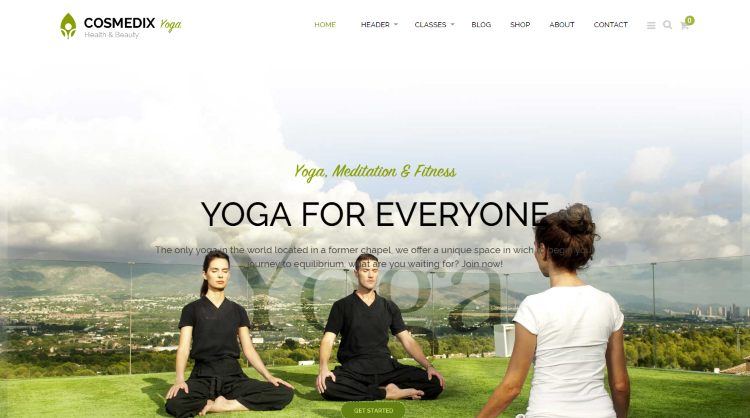 We have listed some of the best Yoga WordPress themes present on Themeforest. While some of them are feature rich, others are brilliantly designed. Which are the ones you liked the most? Share your views in the comment section. YoGa point can be also fantastic theme choice for yoga studio or personal trainer. it is stylish, responsive and fully customizable.